Someone explain to me why I'm still buying this? Am I just a sucker to event comic books? Come on! How can you resist this? 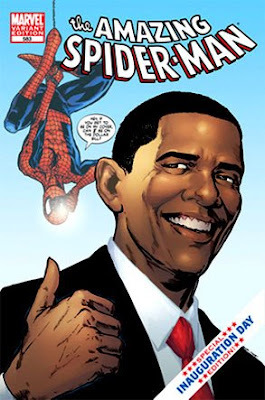 Rumor has it that Obama and Spider-Man do a fist bump. Stop the presses! This will probably knock "The Search for Obama's New Dog" to page 2! People getting killed in the Middle East? That falls somewhere between Paris Hilton's new STD and a feature on Ernest Borgnine. Even Daniel Way hasn't been able to ruin this character. Of course, Jeph Loeb hasn't had a crack at him yet. Dude. You know this is. DON'T LET THOSE DEADPOOLS out of your sight. Actually, bring them all to ME. In JUNE. In GREECE.